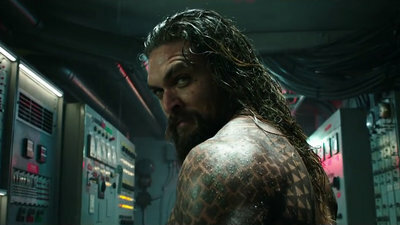 A trailer of a movie " Aquaman ", a protagonist by Aquaman, one of the heroes who defended the earth with Batman and Superman, who appeared in the " Justice League " released on November 23, 2017, was released . The trailer begins with Aquaman's reminiscence of his past by Arthur Curry. "My father is a lighthouse protector ..."
"My mother was a" queen "
"Destiny has bound two people"
Arthur grew as the scene changed. "I heard that" Arthur is talking with fish ". Don! I hit the body, cracks entered the aquarium. Arthur who turned back to seeing that he was formed in this way. In addition, the scene turns into a submarine. What I am getting on is a dubious guy who wears an eyed cap. Arthur who came in by hitting the hatch there. "Can I go on a ride?" I will show you a smile. The two people who held the guns waited unintentionally their faces. Mela who appeared like "I was looking for" Arthur like that. According to Mera, Arthur's sibling brother and sister Ohm is trying to fight against "the table world". Arthur returns "It's absolutely the lowest encouragement ever." Arthur has returned to the Atlantis submarine kingdom. Atlantis itself seems to be pretty cool and I like it. Arthur decided to fight Ohm. "I am not a leader, because Arthur's voice came here because there were no other options." However, Mela encourages that it is meaningful because it is Arthur who knows the two worlds. Can Arthur be a king who carries the two on the ground world and the undersea world? And the way the Arthur and the ohm fight. "Aquaman" is open to the public on December 21, 2018 in the United States.